CYP///'s nya Zone Extender för HDBaseT gör att man kan gå med en nätverkskabel 100m fram till denna, plocka ut en HDMI ur den och gå vidare med en nätverkskabel 100m till. Denna kedja kan sedan upprepas upp till 6 gånger. 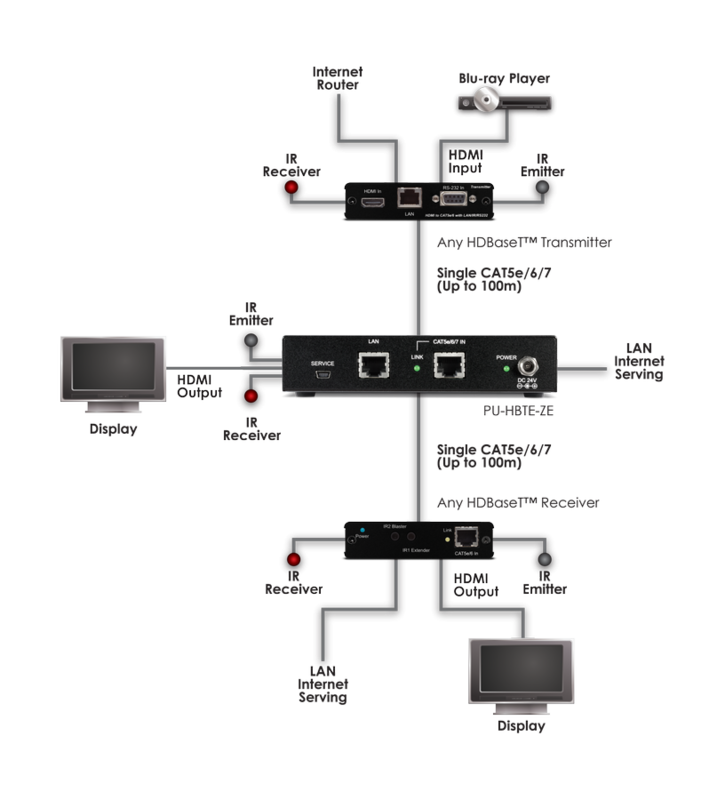 ?The PU-HBTE-ZE HDBaseT Zone extender is designed to allow AV integrators to easily create additional zones for any HDBaseT distribution system whilst enabling the HDBaseT pass-through signal to be extended further over CAT5e/6/7 (up to 100m). This device supports the transmission of video (resolutions up to 1080p Full HD, plus 4K Ultra High Definition, and [email protected]), multi-channel digital audio and control via IR, RS-232 or Web GUI/Telnet IP over a single CAT5e/6/7 cable. The Zone extender allows signals to be transmitted up to 100m from the transmitter device to the Zone extender where the signal can be routed to a local display via the HDMI output. The signal is also transmitted simultaneously via the HDBaseT output enabling it to be distributed up to 100m over CAT5e/6/7 from the zone. The PU-HBTE-ZE Zone extender utilises PoE (Power over Ethernet) to provide power to the connected Receiver unit, thus no requirement for a PSU on the Receiver end. This device can be cascaded up to five times to create additional zones.